Welcome to the 2nd Word Study Wednesday! Today I am actually going to teach you the first step to doing a word study in the Old Testament. Hopefully this won’t be too deep for you. You may never do another word study again, but this is a valuable tool for you to understand. If you are interested in going deeper in your walk with the Lord, then keep on reading. I hope that you are taking the time to memorize this verse. You can put it into your cellphone so it will be handy. Write it on several notecards and place in the bathroom, kitchen, office and/or car. You will then be able to work on it whenever you have spare time. I wanted to take the time with you today to look up some of the words in this verse so we can totally understand what the Lord is requesting in this passage. This will not only help you to memorize it, but it will be more meaningful to you to understand exactly what some of the word means. Let’s take a look at the first phrase, “Consecrate a fast,” hopefully we already know what the word fast means from my previous posts. Take a look at any of my posts from the last week and a half to get an understanding of what fasting is. I am going to teach you how to do a simple “word study”. We will be working with Hebrew because we are using a verse in the Old Testament. The New Testament was written in Greek by the way. In order to know what a word in the Old Testament means, it is best to look up the meaning of the word in the Hebrew language. You do not have to know Hebrew or Greek in order to be able to do this. 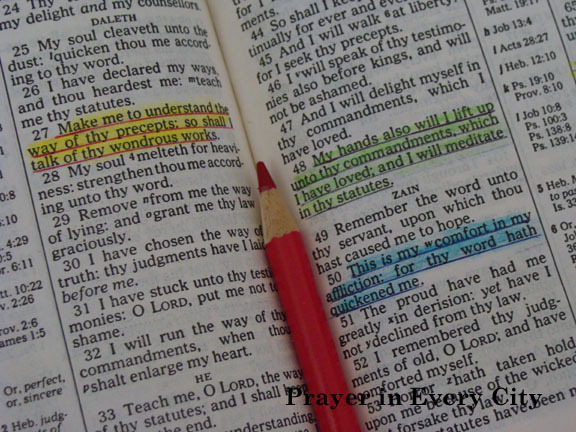 You can easily look up the word in an online Strong’s Concordance, such as Bible Study Tools. It is best to use the King James Version of the Bible when looking up a word in Strong’s Concordance. The word for consecrate in the KJV is sanctify, so type in sanctify and click “search”. You will then scroll down the list until you find “Joel 1:14”, which I found on page 6. Click on the Joel 1:14 to take you a page listing just this verse. Then check the box above the verse which says, “Strong’s Numbers”. Almost every word in the KJV of the Bible is assigned a number in the Strong’s Concordance. This number is referred to as “Strong’s Number” After turning on this feature, you can then click on the word, sanctify to get the meaning of the word. The word consecrate or sanctify (Hebrew word Qadash) (Strong’s Number 06942) means dedicated, be holy, keep, prepare, proclaim, purify, and sanctify one self. I hope this is not too complicated for anyone. I don’t expect you to be able to do this, but just in case you were interested I taught it to you. This is the first step to doing a “Word Study”. If you were do a complete Word Study on the word Sanctify, you would actually look up every verse in the Bible using the same Strong’s Concordance number. That lesson is for another day, however. So we have found the meaning of consecrate. God is telling the Israelites to not only fast, but to consecrate a fast. This fast was to be dedicated to the Lord, they were to be holy and sanctify themselves. I recommend confessing all known sin to the Lord when doing a fast. You can find a sin list here: Sin List from A-Z. I also looked up the meaning to “sacred assembly”, which means a public assembly held especially on a festival or holiday. This fast for repentance was so important that a holiday was set aside for it. In America we can hardly get people to come to church on a holiday, let alone set aside a special holiday just for a fast. We need to slow down and clear our schedules for the Lord. If we are too busy for the Lord, then we are too busy. I pray that our churches in America will one day set aside a special time to pray and fast for our nation. The last word that I looked up was “cry out”. This word means to shriek or anguish, to announce publicly as a herald. This repentance was to be public and they were to anguish over their sins. We need to feel the same way about sin that God feels about sin. Do we really anguish over our sins? God says that sin is punishable by death. Jesus took that punishment for us, but God did not change his mind about sin. He still hates sin especially in the lives of Christians. I hope you were not bored with this lesson today. When I take the time to memorize a verse, I like to dig deep into the verse to make sure I know what every word means.